I’m going to stop apologizing for the lack of posts. But really, I am sorry that things have slowed down here. To be honest, I’ve been busy. Busy finishing up the book, baking this bun in the oven, and getting life in order before both bundles arrive later this year. What’s more, without oysters in my life, there seems to be little to cover at the moment. I promise that will change as soon as I can eat raw seafood again… and as soon as things pick up with the book. Speaking of which, that somewhat neat little stack of papers represents my last go around with the copy. 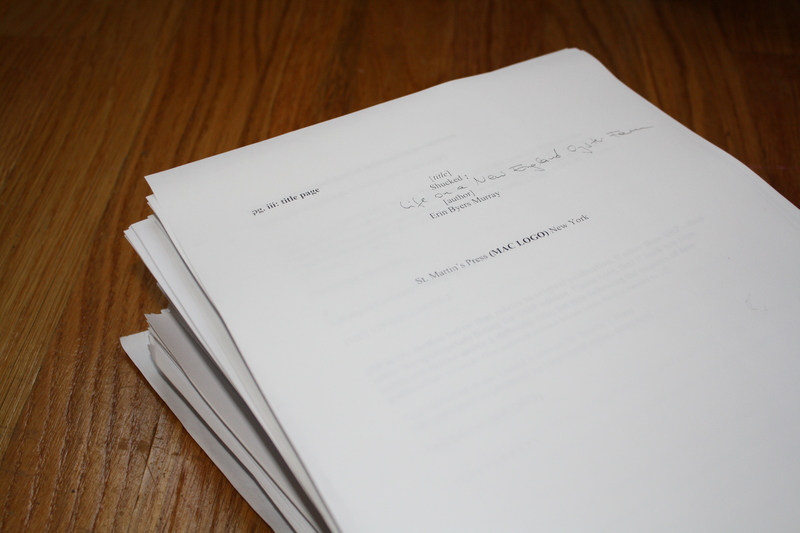 I’ve now gone through two full edits, one with my editor, the other with the copy editor and am now patiently waiting to see the book in galley form (all typeset and pretty like it will look when it’s printed). From the designs I’ve seen so far, it’s going to look awesome and very much in line with my experience on the farm overall. So what’s next? I’ll have one more chance to make tiny changes to the text when it’s on galley and then, we wait some more! It seems to be a lot of hurry up and waiting but honestly, the process has been really smooth and feels like it’s going at a nice pace. Which is helpful since everything else in life seems to be slowing down, too. This week marks my last in the office at Boston magazine but I’ll still freelance for the print edition with pieces like this and this. I’ve also signed on to contribute regularly to their blog, Chowder (I usually post a few times a week so for newsy Boston restaurant content, keep that one bookmarked). 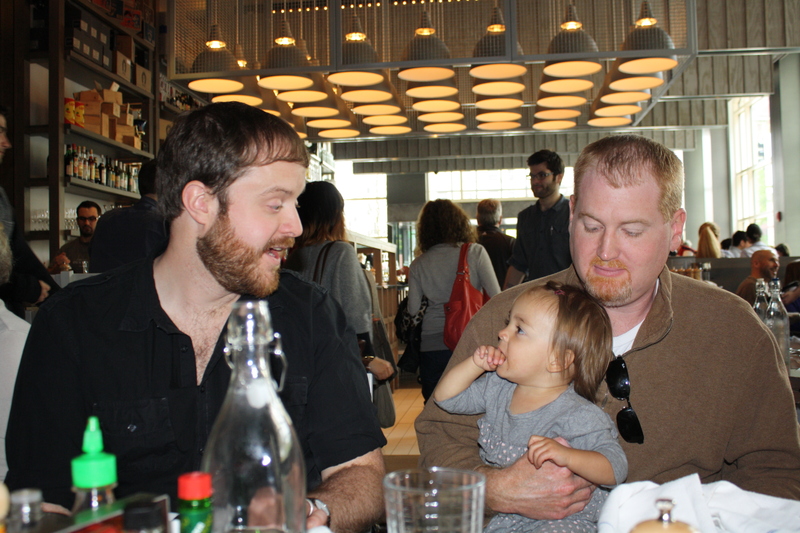 One thing I can report is that we had a lovely Mother’s Day brunch at the Island Creek Oyster Bar this past weekend. I was lucky enough to have my whole family in town (in laws and nieces to boot) and decided to show off my old digs. While my sister Shannon and her husband Brian were the only ones who tried ICOs on the half shell (my sis slurped hers down in seconds flat… mostly so that her daughter Gracyn could play with the shells), almost everyone else at the table tried the oyster sliders which are, in my admittedly biased opinion, the most addictive thing to come out any restaurant I’ve eaten at in the last six months. Oh, and the pastries–which are all made in house–are insane. Haven’t been yet? Drop what you’re doing and go. Right now. Hi Erin, I received a galley just yesterday and I’m half way thru it already and loving it! Congratulations on both the book and the baby!!!! Thanks, Laurie! I’m so happy to hear you’re enjoying it — and thanks for the congrats on the kiddo! We can’t wait for him to get here… See you soon I hope! We should arrange an event when the book comes out. Would love to have you speak at one of our South Shore Locavore meetings! I’d love that, Laurie. I’ll reach out via email to coordinate. Thanks! Looking forward to the book Erin! Thanks, Julie! Keep an eye out for it in October!